A Confederacy of Dunces Typescript–Sold! 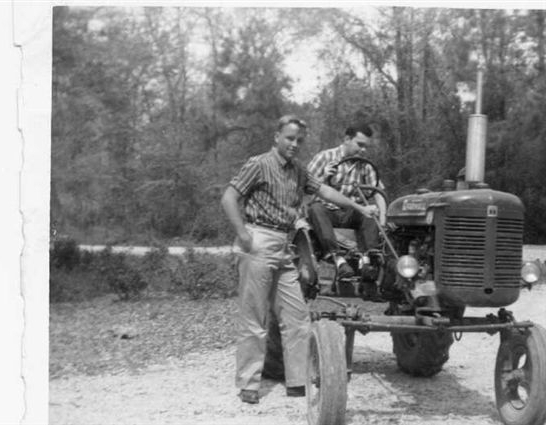 The young John Kennedy Toole attempts to shift gears on a tractor in Mississippi as his best friend, Cary Laird, poses for the camera. Days later Toole would begin writing The Neon Bible. Last year I wrote an article about the lost manuscript to A Confederacy of Dunces published in The Millions. You can read it here. I just got word that the document I saw that day (a typescript of the novel with some edits) was recently sold at auction, along with some rare pictures of Toole for $31,000. One of those pictures appears in Butterfly in the Typewriter. The photographs were taken during Toole’s trip to Mississippi, which inspired him to write The Neon Bible. The University of Louisiana at Lafayette acquired a handwritten letter from Toole last year (also included in Butterfly) through a Sotheby’s auction. I suspect there is more Toole material out there waiting to be uncovered…. Here is the Sotheby’s auction with images of the typescript.